This time last week Sebastian and I spent the day with our mothers. But in between our second visit to my mothers at the cottage, we went for a stroll and soaked up the beautiful Spring weather. There is a lovely track that runs behind my mothers cottage and loops up to the main road. It is the sweetest walk filled with lovely old cottages and old loving horses. 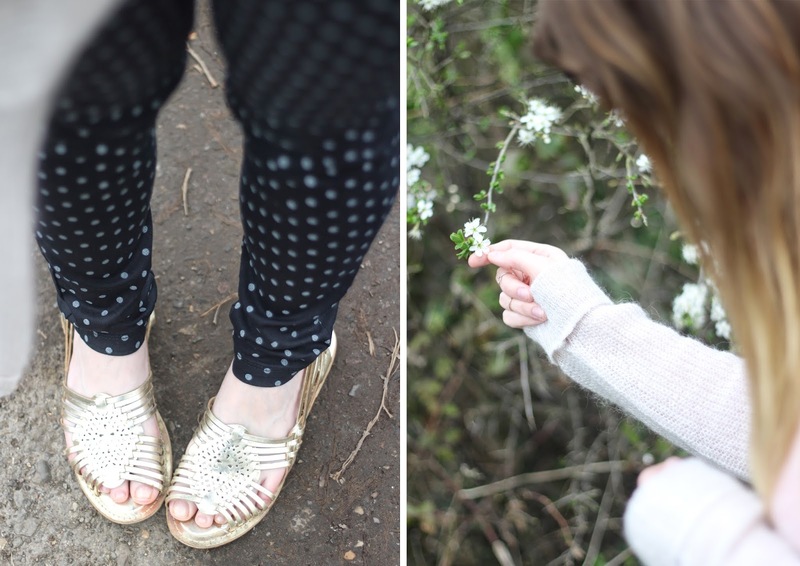 What better way to show off my fancy new 'Polka Pants', frolicking through the twigged trees and blossoming branches. I went for a little retail therapy recently, badly in need of a whole new wardrobe due to all my clothes either not fitting nicely or no longer appealing to me. So when mother and I visited the cobbled streets of Canterbury last week I just had to purchase a few treats from Topshop. 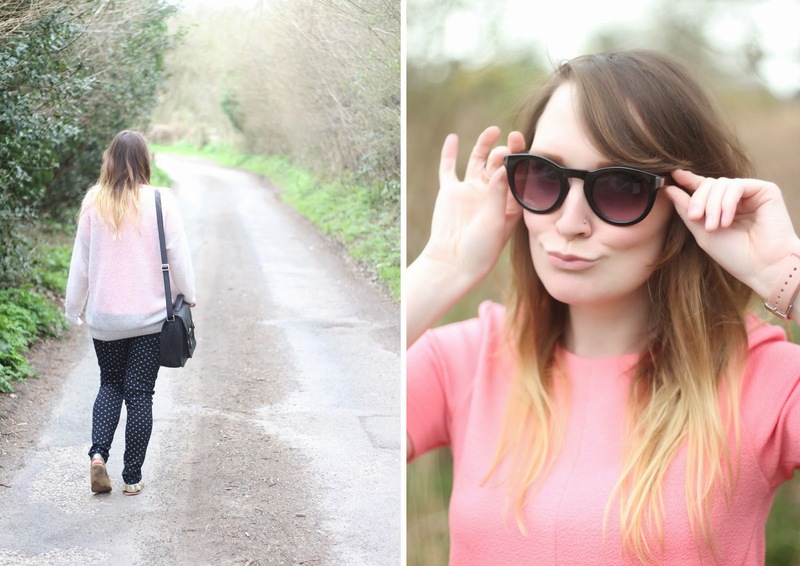 I needed some pretty tops to go with these darling new trousers after all! These sweet Spotted Slim Jeans* are from Great Plains and are quite easily THE most comfortable jeans I have ever worn. The good thing about them is that they look more like trousers than jeans and you can create a smart look by teaming them with a nice white shirt. I teamed my Navy and Buttermilk pair with some two-year-old gold Primark sandals (I am dreading the day they die!) and my new Pink Crepe top and light knitted grey jumper. 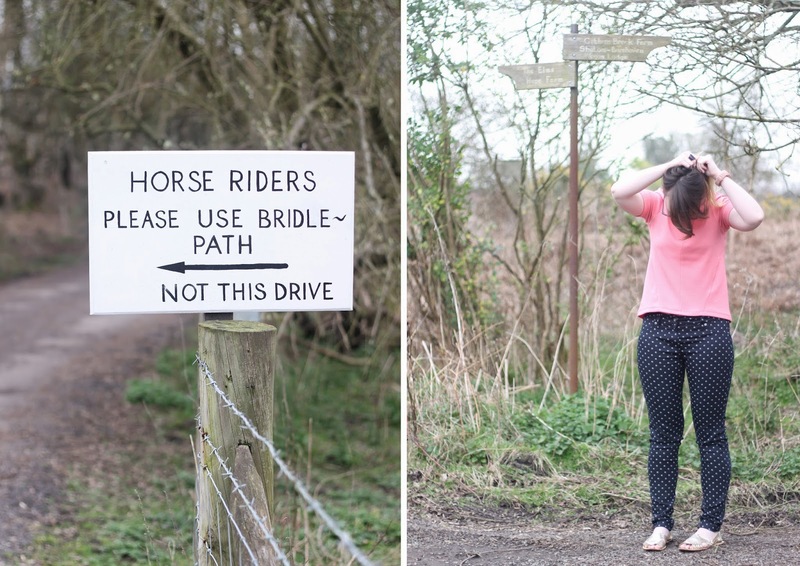 It is the perfect outfit for exploring the winding paths and for horse spotting on a lovely Spring afternoon. All that was needed was a little more sunshine. I had never heard of Great Plains before now, and I am in love. They have some wonderful pieces like the canvas brogues and Peppermint cotton jeans which are on my ever growing Summer wishlist. Great Plains are about simple shapes but in beautiful pastel shades and fun prints like the strawberry fields and the village houses. It is just a perfect Spring Summer wardrobe. I am keeping my beady eye on the beautiful buttermilk canvas shoes as they would go perfectly with these pretty polka pants. It's my birthday next week and I cannot wait to go shopping for new clothes and prepare for Paris. It really has been so long since I updated my wardrobe space... I have had a nice ol' clear out this weekend so watch out Ebay! Enjoy the rest of your Sunday lovelies. I am off to buy groceries and snuggle up to Sebastian with a yummy Spaghetti Bolognese tonight. You are so cute!! I love Great Plains too- such lovely pieces, and these trousers are particularly awesome. And in advance- happy birthday for next week!! Happy early birthday! I hope you enjoy it to the fullest when it comes around. Gorgeous spring outfit, I really love the trousers! Those pants are to die for! That is a really gorgeous strip by your mom's place. Such a serene location it seems. P.S. Nice pants! Such a lovely outfit, and looks like a lovely day too! I hope you have a wonderful birthday next week! this is really cute! love the polkadot pants! err trousers. (haha! thinking about the little mishap with nicola right now!) love the last part of this post about snuggling up to sebastian ~~ so cute! hope you have a lovely day, charlotte! I was never into patterned trousers but after buying my first pair of polka dot trousers im sold!